The following are only guidelines for food safety; please make your own decisions about what you're comfortable packing and eating (I am not a food safety authority). Japanese bento cookbooks traditionally suggest packing foods with antibacterial properties in lunches in order to keep food from spoiling. Suggested foods include umeboshi (pickled plum), wasabi, ginger, karashi, salt, shiso, parsley and vinegar (i.e. making sushi rice, or putting an umeboshi or a tablespoon or two of rice vinegar in the cooking water when making rice). Some recommend wiping the inside of the bento box with a slice of ginger before packing. This is all fine and good for Japanese food, but that's not what I usually eat for lunch. 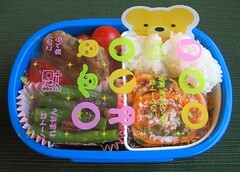 There are a number of bento products in Japan that have been treated with an antibacterial coating (i.e. flavorless compounds extracted from wasabi, etc. ), designed to stave off microbial growth in packed lunches. 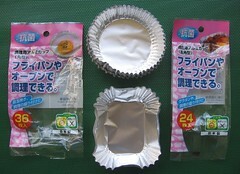 These include aluminum food cups for cooking, plastic sheets that you place on the surface of your packed food, and food dividers that look like sushi grass. These must be touching the surface of the food to be effective. Not all food dividers and food cups are antibacterial; they must be marked "antibacterial". I bought the products below at local dollar stores and markets in San Francisco; click the photos for larger views with the "antibacterial" character indicated. Make sure your hands, food prep area, utensils and lunch containers are clean. When possible, use utensils (chopsticks, spoon, tongs, plastic wrap) to place, mold and arrange unwrapped food in your lunch container. If you're using a bento box with a rubber packing strip around the lid, be sure to periodically remove, wash and thoroughly dry the packing seal (and the groove in the lid). This will keep your box clean and ensure that the packing strip does not crack, which would leave you without a watertight seal. The danger zone for bacteria growth is between 40 to 140F (4 to 60C, or room temperature). An extremely effective way to keep food safe until you eat it is to minimize the time food spends in this temperature zone (ideally less than three hours). 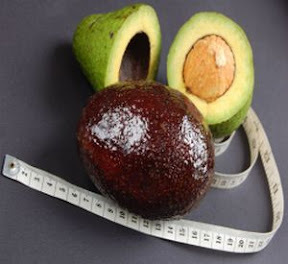 The USDA's food safety page has a number of useful guidelines. Keep hot foods hot by using a pre-heated insulated thermos or food jar for liquids like curries, soups, stews, etc. To pre-heat, fill the thermos with hot water, let it stand for a minute or two, empty the thermos, and fill with hot food (close it quickly!). You can get little kid-sized 300ml food jars at superstores like Target or Walmart, bigger food jars, or even large thermal lunch jars with multiple containers inside (like the Mr. Bento or Ms. Bento) from online stores Amazon.com. Keep cold perishable foods cold by storing your lunch in a refrigerator (if available) or using insulated lunch bags or containers with cold gel packs. Western versions include insulated lunchboxes, the Laptop Lunchbox, Fit N Fresh containers; Japanese versions include insulated bento bags and picnic sets, bento boxes with a gel pack integrated into the lid, and insulated bento kits (with a thermal jar for the lid, two lidded side containers and an insulated carrying bag that you can put a gel pack into to carry hot and cold items at the same time). Thermal lunch jars can also be pre-chilled with ice water and used to pack chilled lunches. 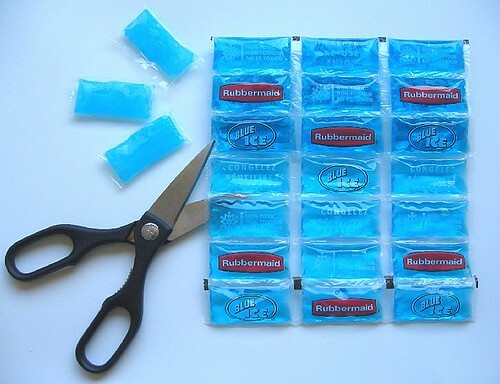 Flexible ice blankets are essentially a quilt of small reusable ice packs. They can be cut apart to produce many small ice packs, perfect for throwing into an insulated lunch bag (ice blankets are widely available at sporting stores, wholesale food stores and drugstores). Click on the photos below for a larger view. Pack less perishable foods, especially in the summer. Rice becomes hard and unappetizing when refrigerated at low temperatures, so many Japanese forego refrigeration and cold packs for their rice-based bentos, choosing instead to incorporate antibacterial foods, pack foods that are less likely to spoil, and make their food less perishable through traditional cooking/packing methods. Japanese bento cookbooks instruct you to make sure all food in a packed lunch has been thoroughly heated through to the middle, so in hot weather scramble eggs until they are dry. Avoid raw or rare meat, poultry, fish or eggs. Avoid raw fillings for rice balls (make sure tarako fish eggs are grilled). Heat (then cool) even processed meats like sausages or hot dogs before packing to kill any bacteria that may have been introduced after processing. Avoid dairy products such as yogurt (especially when spooned out of a larger container). Avoid packing regular tofu in the same container as other foods as it sheds water and spoils easily. Avoid raw vegetables except cherry tomatoes. Avoid cut fruit as it spoils easily; pack whole fruit like a banana instead. Exercise caution with cooked rice, potatoes, grains and legumes (spice heavily, mix with antibacterial foods, dry thoroughly). With moist, liquidy foods, first dry before packing (drain in a small colander or on paper towels) and pack in a paper food cup to contain any excess moisture. Spice foods more heavily than usual. 3) CookWise, Shirley O. Corriher, 1997. 7) Aijo Tappuri! Obento, Shufu no Tomo, 2007. 8) Obento Daijiten, Index Magazine, 2005. 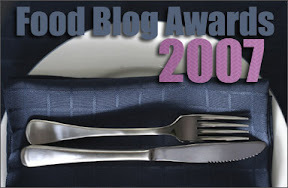 If you like what we do here and would like support us in the Blogger's Choice Awards, vote here. Thanks for your support! This Post was written by Biggie from Lunch in a Box. WOW! Biggie, this is an incredible post. I have actually printed this out and added it to my folder in the kitchen so that I can easily refer to it whenever I want to. I never knew there were actually products with an anti-bacterial coating on them. Are these coatings natural and do not effect the food in any way? 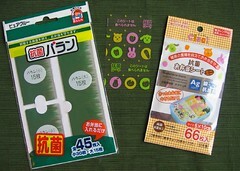 The coating on those particular products is a flavorless wasabi extract, so it's all-natural. I believe scientists in the U.S. are working to develop something similar using oregano extract. BTW, it looks like I accidentally managed to disable comments on my post! D'oh! Thanks for getting that straightened out.